On the tenth anniversary of her mother's death, fourteen-year-old Madge Darling’s grandmother suffers a heart attack. With the overbearing Grandma Wendy in the hospital, Madge runs away to Chicago, intent on tracking down a woman she believes is actually her mother. On her way to the Windy City, a boy named Peter Pan lures Madge to Neverland, a magical place where children can remain young forever. While Pan plays puppet master in a twisted game only he understands, Madge discovers the disturbing price of Peter Pan's eternal youth. I am always intrigued by re-tellings of fairy tales so when I saw that this was all about Peter Pan and Neverland my interest was captured and what a dark, twisted, fun read it has been! Really think the cover added to my intrigue as well as it is such a striking image and gives a hint of the darkness of the world you are about to enter! 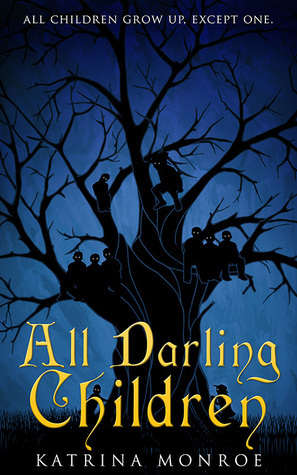 The Darling link with Neverland and Pan is fully explored in this dark adventure, and the current story is also littered with extracts from Wendys' diary of her time in Neverland and how her time there was definitely no Disney fairy story! After watching the TV series, Once Upon A Time, they really showed a darker side to Pan and this book adds to that sinister side and the control he has over so many and how he manipulates those around him to get what he wants. All the favourite characters are involved in this story -Hook, Smee, The Lost Boys - and I really loved the fresh approach to the story and how you are often left wondering just who to trust and believe as many of the characters have such dark sides! There is violence and swearing so be warned if you are easily offended by such goings on! I voluntarily reviewed an advance reader copy of the book courtesy of the publishers and NetGalley.